Hubby and I already have our Christmas gift for each other...'ya know...the 'elliptical machine' we got a few weeks before Christmas. Yeah...that one. We have yet to put it in 'full use' but we'll get there...eventually. Anyway, the little one wanted to give us her 'own gift' so she secretly told us [seperately] of her plan. The good parents that we are [achoo! ], we pretended we didn't know anything about it. But the husband didn't want to 'shop aimlessly' [as he called it] so he asked me what I wanted. Hmm...so much for secrecy, eh? I told him I'll clue him in when we're out 'looking' for the gift once I see something I like. We were out of time so we had to do everything on the same day we went to the mall. Luckily I saw this 'carousel' in no time and 'clued' the husband in. He and little one bought it while I walked 'aimlessly' around the 'Bath & Body Works' store nearby. LOL... Anyway, for her 'surprise gift' for Dad...it was easier for me to look for it since I do most of the 'looking' online. What did we get him? A wallet, of course! I know it's nothing mind-boggling but I thought it's something that Daddy needed since the one he's using is the one we gave him last Christmas. LOL...Now you know what he's getting NEXT year. Ha! that's so cute. buti kayo ni M may kalaro. pwede pa siyang i-trick hahaha. kami dito we were clobbered with snow - almost 2 feet sa amin. F worked from home, as all mode of transpo were suspended all of New York. mga kuko ko nga nangingitim na sa ginaw. hope you're having a great start of the week. 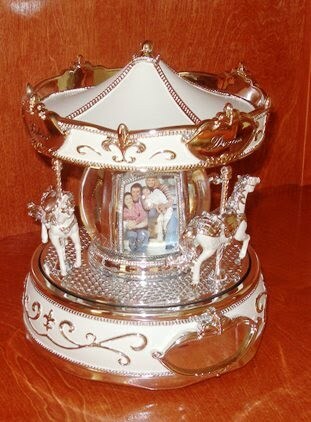 what a cutie carousel! e di na-surprise ka getting the gift you want?! ha ha... at masaya pa si E sa bigay nya sa 'yo! that's what matters, di ba?. yung gift mo kay M, ang hirap talaga isipin eh. he he.. ako din, wallet at wallet pa rin ang naiibibgay. konti lang nman kasi pang-gift sa kanila. Ready na ba ang pang Media-Noche? Dito hindi pa rin. Still thinking of what to cook. Enjoy the season and have a relaxing day with M and E!